Recently re-elected director Jordan Epstein will be the chair of the board and chief governance officer of the Wilfrid Laurier University Students’ Union for 2013-14. Epstein was elected Wednesday night at the first meeting of the board-elect, which was voted in following Feb. 5’s election. Epstein was the only director-elect to express interest in the postion at the open forum prior to the election, and was the only nomination at Wednesday night’s meeting. Epstein will be entering his fifth year at Laurier next year. He was first elected to the board last year and has served as vice chair for the 2012-13 year. In addressing his fellow directors-elect, Epstein said his main priorities were to increase year-long training for directors and promote transparency between the board and students. The chair of the board’s most visible responsibilities revolve around running the WLUSU board of directors meetings. 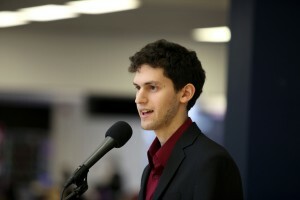 However, as CGO, Epstein will also play a large role in the policy and planning of WLUSU. He will also act as a representative of the board among the Union’s management team, which includes president-elect Annie Constantinescu and the yet-to-be-hired vice presidents. After Epstein was approved as chair and CGO, returning director Kate Stevenson was elected vice chair for the 2013-14 term. Stevenson was one of four nominees for the position as fellow returnee Matt Casselman, and newcomers Colin Aitchison and Matt McLean were also in the running. WLUSU’s new board and management team will officially take over May 1.